The slogan on the label translates to “Death to Bad Beer Always”. 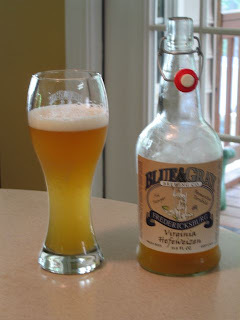 Virginia Hefeweizen from Blue & Gray Brewing Company is the Summer seasonal from the Fredericksburg brewery. The brewery uses German Weihenstephan Weizen yeast and American Wheat to produce their version of a classic Hefeweizen. The beer was released over the Memorial Day weekend, but I just picked some up this week. Colleen and I decided to enjoy it as an appetizer while our dinner was cooking. Poured from a half-growler into an official Blue & Gray Weizen glass, a short lived head white head forms over the cloudy, straw-yellow beer. Immediately the banana and fruit aromas are noticeable. A slight peppery spice is also noted in the aroma as well. The taste is refreshing with the expected strong banana and clove flavors. There are nice spicy, peppery notes present as well. Virginia Hefewiezen also has a surprisingly strong, but pleasant hop profile. The mouthfeel is moderately thick and creamy, with low carbonation. The finish is somewhat astringent and the hop bitterness lingers on the palate. We found the Blue & Gray Virginia Hefeweizen to be a very enjoyable start to dinner on a very hot day. We've enjoyed the Virginia Hefeweizen in past years but Colleen remarked that this year it seemed exceptionally nice. The beer will be available all Summer long so I'll surely be back for more growler fills. I totally agree with you review. I really enjoy this time a year when Hefeweizen are plentiful. Nothing better than enjoying one after mowing the lawn on a hot and humid summer day. Ahhhh!